Religious leaders say they will fight the government's new policy on anti-abortion groups and summer jobs grants, and take it all the way to the country's top court if necessary. Religious leaders say they will fight the government's new policy on anti-abortion groups and summer jobs grants, and will take it all the way to the country's top court if necessary. Charles McVety, president of the Canada Christian College, said a nationwide prayer protest is planned for this Friday, and petitions are being circulated across the country. They're mounting opposition to the Liberal government's application form for organizations applying for federal summer jobs funding that now requires applicants to check a box affirming they respect the values set out in the Canadian Charter of Rights and Freedoms, including women's reproductive rights and LGBT rights. 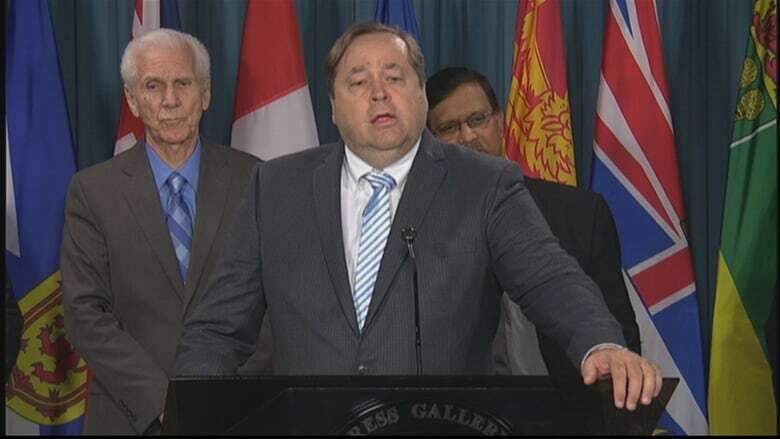 During a news conference with faith leaders on Parliament Hill on Tuesday, McVety called the new policy "draconian," "communistic" and a violation of charter rights. "Ideology tests do not belong in this country of Canada," he said. Rondo Thomas, director, Evangelical Association of Canada. Peter Marshall, president, Canadian Religious Broadcasters. Efrem Leakermarian, director Ethiopian Evangelical Association. Pastor Tony Soldano, from the All Peoples Church. David Loganathan, president, Tamil Pastors Association. McVety said the issue is top of mind for Christian Canadians, who are joining forces to fight what he called "pure discrimination." He worries the policy will be expanded to other federal government programs. "We have to fight every one of those programs, and we need to continue to fight this in the court of public opinion and if need be, we'll have to fight it through the court system and all the way to the Supreme Court if we need to," he said. McVety said camp counsellors could be denied jobs because of their beliefs, stating that student participants will also be required to sign the form and "attest to supporting abortion and multiple genders." A spokesperson for Labour Minister Patty Hajdu said that is not correct. "No, the students do not have to sign an attestation," said Matt Pascuzzo in an email. "The Canada Summer Jobs 2018 application simply asks organizations to confirm that both the job and the organization's core mandate respect individual human rights and labour laws and do not support discriminatory practices." At a town hall in Winnipeg on Wednesday night, Prime Minister Justin Trudeau delivered a strong defence of the new policy, while praising the "extraordinarily beneficial impact faith groups and churches have on shaping and strengthening communities. "No religious group is going to be barred from Canada's Summer Jobs on the basis of their beliefs, period," he said. "Anyone who tells you otherwise is pushing a political agenda. However, there are certain groups that are specifically dedicated to fighting abortion rights for women and inclusion of LGBT communities, and that is wrong." Trudeau cited the Canadian Centre for Bio-Ethical Reform, which advocates against abortion, for distributing "hateful flyers" to try and roll back the clock on women's rights. Marshall said freedom of religion is under attack and called the move "discriminatory and fascist." "If we go down the road of what our prime minister is trying to do with this policy, then is it OK to be punitive toward those that don't embrace your philosophy, your ideology or your political viewpoints? That is tyrannical, and very dangerous to our country," said the president of Canadian Religious Broadcasters. Michael Bryant, executive director of the Canadian Civil Liberties Association, also raised constitutional questions about the federal application process. "CCLA has been freedom fighting for 50 years, so the feds' promotion of Charter rights is great news, except when the government becomes thought-police, telling organizations what they have to stand for, in order to obtain federal funding for a program for which they'd otherwise be eligible," he wrote in an email to CBC News. "A summer jobs program criteria that disqualifies applicants because of their beliefs, values or opinions is probably an unconstitutional program. What's the purpose of the program? What's the effect of the program? If either targets a particular group on the basis of an immutable characteristic, then it's constitutionally risky. The current wording on the application form and website reads quite differently than the supplement that makes a distinction between activities and beliefs."